Saving Money On "Real Food"
I received the following email from a reader, Janelle, and thought the discussion would be helpful to many of you. I’ve been reading your weblog off and on for a while, and have a question for you. I notice that most (not all) of the “deals” you get, and that are out there with coupons are for foods that I don’t choose to feed my family. Processed, not organic, not local, containing high fructose corn syrup, etc. While I admit, we’re not perfect, how does a family that often eats granola (from the bulk bins or homemade), homecooked meals, and uses natural or kitchen (vinegar, etc) products to clean, actually use the tips that you offer for saving money in groceries? I do score on the times that cheeses, some crackers and such go on sale, but we’re not big eaters of “boxed cereal”, frozen meals, cow milk, soda, or that kind of stuff. We have a food budget of about $300 for two adults and an almost 4 year old, and stay under it most months, but it’d be great to do better. To speak directly to this reader, your monthly budget is really low for eating the type of food you are eating. You’re doing a great job. You are already using strategies to save money — cooking from scratch, using simple ingredients to cook & clean, and being intentional with how you spend your money. You could probably teach us a lot about saving money when shopping the perimeter of the store! The more “unconventional” of a shopper or eater you are, the more difficult it is to save money in the conventional way — by couponing and store sales. Manufacturers release coupons on products that #1. they produce and #2. that the mainstream is consuming. General Mills does not provide fresh, real food. It’s not their business. And it’s these companies that release coupons. The more mainstream a product is, the more incentive manufacturer’s have to release coupons. The more the mainstream public buys environmentally-friendly cleaning products, for instance, companies will offer more opportunities to save on these products. Be patient. Ways to save on organic, local, environmentally-friendly products are coming. Buy as much as possible in bulk (the Bob’s Red Mill store in Milwaukie is a great option). You don’t have to go there every week — I do my bulk item shopping once every few months. Buy beef (if you eat it) in bulk from a local farmer. You can get high quality, grass-fed beef relatively inexpensively this way. Honestly, fresh, local, organic food costs money. It’s not cheap for small, independent farmers to produce quality food. The higher the quality, the more you will spend. That’s why I try to spend as little as possible on the “junk” (which we eat) by couponing to free up more money to spend on the quality food. And just to address the anonymous commenters that question what Rebecca and I are buying during our deal trips — the stuff you see posted makes up only a portion of what we purchase and serve our families. We are both committed to eating lots of produce, local meat and high quality dairy. But posts about our regular priced produce trip or outrageously priced raw milk would be uninteresting to most of you. This is a blog about couponing and saving money by living frugally. Period. I hope we are serving those of you desiring the same well. Please leave a comment if you have other suggestions for how to save money without using coupons on “real food” or other resources out there on the web! I buy organic beans, soups, stocks, tomatoes, tomato sauce, pasta, eggs, bread, and dairy with coupons. And except for eggs and dairy I rarely spend more than a dollar for each item. My buy price for cheese is $2 a pound (Tilamook white cheddar) and $1.50 a dozen for organic eggs. I recently bought 2 1lb O organic spinach at safeway for free ($4 off catalinas and JJ catalinas). Dozens of cans of Muir Glen tomatoes for free at safeway ~6 months ago. (Coupons, double, $10 of $50, and kraft catalinas). Organic milk for $2 at Fred Meyer and $2.39 at safeway. Half gallons of shelf-stable Pacific organic milk at grocery outlet are $2. Organic valley allows you to print unlimited coupons if you use virtual machines. Stieber's farm 2 for 1 in Chinook book. Organic cage-free eggs for $1.50/12 at new seasons. If there are no deals at new season, grocery outlet sells organic cage-free eggs for $1.20-$1.50 a dozen (depends on size). I could not begin to count how many organic Oikos yogurts I have bought for free at Whole Foods! Hint: stack manufacturers coupons, whole-deal coupons, case discount, and (!) $10 off 50 coupons in the Chinook book. Cascadian farms organic frozen vegetables (and tater tots) at new seasons and whole foods for $1-$2 with coupons.com coupon. Once again you can print unlimited coupons with virtual machines. I rarely shop at new seasons or whole foods without getting at least 50% off. I only began using coupons in April. Granted I saved a lot of money, but yes it was a lot of processed foods. Being vegetarian and trying to make the transition to vegan, couponing doesn’t work out all that great. But, buying in bulk and cooking from scratch helps. For those looking for less expensive organic options, Grocery Outlet is a pretty good option. I have seen many organic (even vegan) options there inexpensively. The trick is if you find something you like stock up quickly…good stuff sells out fast! For the last three years, we have purchased a CSA membership in Gathering Together Farm, an organic grower with a stand at local farmers markets. We get a box of seasonal organic produce (mostly veggies, some fruit) each week from June through November. I pick up the box at the Wednesday downtown farmers market and haul the produce home on the bus. This has been a great value for about $16 per week. The produce is farm fresh and costs less than you would pay for conventional produce at Winco. We have to buy a larger box this year so the weekly price will go up but so will the quantity. Another advantage is that we have to cook and eat all of this good stuff which reduces trips to the grocery store and dining out. Here in the Portland area I have combined couponing with fresh organic produce delivery to find a balance. The money I save on pantry staples via couponing helps make $35 a week for organic produce delivery from http://www.spud.com doable with our budget. I can order exactly what we want, plan my sides for meals for the week, and end up with very little produce waste. Janelle: Speaking of gardening in small spaces, I found this interesting post about just that. People can get really creative. I agree with Safeway’s produce quality — it’s pretty hit or miss at my store too. Fortunately they have a great return policy — if you’re not satisfied, you get your money back and they replace it for free. I’ve returned some stuff before. It was worth the hassle. As basically zero-income full time undergraduate students, we primarily shop where food stamps are accepted (not Costco) and it’s great that we can shop at most farmer’s markets. I didn’t say anything about not wanting frozen veggies- it was frozen _meals_ that we try to avoid. Now, we’re not perfect, and have made some concessions… We primarily buy Foster Farms chicken, since it’s relatively local, and choose our produce based on the Environmental Working Group’s clean/dirty foods (check out http://www.foodnews.org/ for the list) which means it’s not ALL organic, but the important stuff is. Our main way of saving money has been mentioned before- plan ahead. We plan the meals for a week, shop to that plan, and make enough leftovers that we can freeze and take for lunches on future days. And I keep in my brain the things we normally use, and stock up on them when they’re on sale to the degree that we have space to store (with limited freezer/storage for food in our house). We usually make one shopping trip a week, which is what we can manage with our school schedules… living near downtown, a trip to WinCo happens maybe once a month, but we love their frozen food prices (go chicken!). I’m also all about growing my own food, but don’t have the space to do it on a scale that really impacts our food budget compared to the amount spent on growing (water, dirt, seeds, etc.) but it’s good for my mental health, so I keep doing it to improve my skills for the day we have a real big garden space. Safeway may have great produce sales, but the one in my neighborhood doesn’t usually have very good quality produce. Great post! Nothing stirs things up in couponing-circles like this topic. 🙂 I've really enjoyed reading everyone's opinions & suggestions. This can be a sensitive topic because it's a personal one – how to best care for your family. I think it's important to remember that we're all in this together, seeking to feed our families to the best of our abilities and resources. I love Bob's, Trader Joe's, New Season's loss leaders, Winco bulk, Costco, Penzey's Spices, my backyard, and farmer's markets for quality (often organic) products. Coupons for natural/organic items can sometimes be found by going directly to a company's website and/or requesting them. Maybe the more requests they receive from consumers the more we'll start to see these types of coupons?? Since I jumped on this crazy coupon bandwagon in October, not only has our grocery budget significantly decreased but our eating habits have improved! I could say a lot about this! I think it is very possible to buy, on a budget, all or almost all your food as organic if you are willing to plan a menu and prepare from scratch your meals. We spend $250/mo or less for a pregnant mama, hungry husband and a very hungry toddler, and buy about 80-90% organic. (I’m not a SAHM either.) I’ve written a few post about how we do this but in short I recommend looking into resources like Costco, Bob’s Red Mill, Chinook book (which has coupons for Bob’s Red Mill; you can trade some coupons with friends or people on craigslist as well), local produce buying cooperatives and Azure Standard. Maureen – I’m with Kirsten on the Safeway coupon. Your cashier isn’t trained. I have the same coupon, haven’t used it yet though. Also, just yesterday, Safeway kicked me out a catalina coupon for a FREE California Kitchen pizza, so I doubt they give out coupons that go against their policy. I’m sorry, but how are “cow milk” and frozen vegetables considered “that kind of stuff”? Food choices are so complicated. For example, if you drink soy milk, you might like to know that huge areas of natural wetlands in South America are being drained and destroyed so soybeans can be grown to satisfy Americans’ new love of soy products. To speak more directly to your concerns, I’ve used coupons for SoyJoy bars, Kashi natural foods, Muir Glen organic canned tomatoes (yes, we eat tomatoes out of season), organic milk, etc. And I bought all of those at conventional grocery stores, not the high-priced “natural” stores. Great post – great comments! I struggle with this issue a lot too but most of the time I have peace about it. As another commenter mentioned, I donate a lot of the free personal care products and dry goods that my family wouldn’t use – I don’t “buy” something we won’t use unless it is free or a money maker. Most of the things that we use coupons on end up being free or very low cost and so I figure that while I’d like to do every food item organic, I choose not to scorn what is provided for free! I think that as with everything, it is about balance! We try to live simply and so if that means that I can’t use all the coupons that then that is probably a good thing – it means that I have found a cheaper way to make it (cleaning products, bread, etc.) or I’ve found that it is simply not necessary for our lives. While our family doesn’t eat as much organic as we would like, we do eat “real” foods prepared from scratch MOST of the time. Cereal is my guilty pleasure, making it possible for me to imbibe more coffee rather than stir another vat of steel cut oats. We have a food/household item budget of $700 for a family of 9 (We have 7 kids ages 15, 13, 11, 10, 5, 4, and 1.) Couponing is making it possible to buy better quality ingredients as well as stock my freezer when meats go on sale. Regarding cheap organic/fresh produce…I found a man on Craig’s List last summer that goes to the Hood River area weekly and buys wholesale from the growers. Prices are great and the produce is to die for! It is large quantities so be prepared to eat, can, freeze, or split immediately. I shares peaches and cherries with my sister one trip and cleaned and froze raspberries from another trip. If anyone wants info please email me at s-g-i-o at comcast dot net and I’ll pass on his email – he will start trips in mid June and run through October. Maureen, that is BS. I took the same SAFEWAY coupon to Safeway and it was accepted w/o issue. I’d speak with the manager and have this employee trained. I do most meals from scratch so some of the things are not things I'd choose to feed my family. Although mac & cheese 1-2 month for lunch, so it was nice to get cheap ones this past week. Two thoughts – $300 is a super low budget. And Safeway has GREAT produce sales. I think if you eat based on what is on sale or seasonally (think farmer's market), it makes a huge difference. We don't eat bell pepper unless they're .99 each. I'm not spending 3.99 on one just because I "need" it for a recipe. I was so excited, I had a coupon for free strawberries from Safeway today. I never get coupons for produce! I got the coupon from the Safeway website and everything. Well, I went up to pay, the cashier wouldn’t take it. He said that Safeway had a policy of not taking coupons for free things. What the heck! I had done a huge trip, the lines were horrendous and he was soooooo slow, I just bought the strawberries anyway. They go bad so quickly though, I hope we have time to eat them. Like someone above said, Wholefoods’ coupon booklet has some coupons for eggs, cheese, pasta etc. I signed up for e-newletter that tells about sales. Chinook Book has some coupons for organic food/organic markets too. It’s $20 but sometimes gets down to $15(I bought it for $15 last Nov. Also, a couple weeks ago Newseasons had a sale for $15). Some co-op type of grocery shops have member appreciation sale from time to time. Foodfront, for ex, has 10% off sale every couple of months (membership is $150, as long as I remember, but you can pay like $5 a month or so). I grow some of my veggies: I don’t have to buy salad mix from Apr-Oct. Don’t throw away green tomatoes in the end of the season. Put them in a bowl and leave on kitchen counter. They get red as time goes. I had a bowlful of minitomatoes last Sept. and I put them in the lunch of my preschooler almost everyday till early December. I started making bread on my own. My bread maker does most of the job. It’s just time consuming. Now I’m trying to make yogurt, too. I wonder what else we can make on our own. We are fortunate to have a local produce store in our town. They only sell fruits, veggies and some organic dairy. They try to buy as much local as they can and even grow their own veggies in the summer so their prices are usually awesome, but I always browse the discount shelf first before shopping in the rest of the store. I primarily look for bananas that I then take home and freezer for smoothies or baking. I’ve been known to get bananas for $0.29 / lb. I also try to only use baking soda and/or vinegar to clean my house. Not saying I don’t bust out a can of pledge to do the wood – but even a little bit helps. Baking soda seems to come on sale BOGO a fair amount and vinegar is pretty cheap so this certainly helps my OOP expense. for about 7.00 total…yup – that’s pretty good! we try to eat a lot like janelle and her family but our budget was not even CLOSE to hers- and i bought a 1/4 of a cow and grow some of my own veggies! i’m not quite sure HOW she could only spend 300/mo on all organic but it is impressive and i’d love to know more! for us – i buy all my household goods and things that ARE boxed or canned with coupons that frees up TONS of money for my organic produce, meats and dairy! it’s amazing! it’s worth it – not to mention i get to donate TONS and i mean TONS of household stuff and food to people in need. great job on the blog ladies – i love it! When fruit comes into season, I search online for UPICK locations. That is often times a cheaper alternative to the Farmer’s Markets as well. I have to pick a lot of fruit to make up for the fuel expense end — or go with a friend and split the fuel cost. 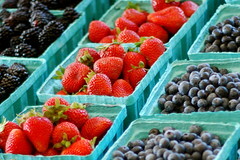 My kids love the outing and to help to pick — anything from strawberries to blueberries to apples, pears and peaches. Some smaller farmers have U-Pick fruit really cheap! I’m not big into canning — I do it in small batches because to me it takes so much time because I am so slow. But I do enjoy freezing the berries, making fruit leather or dehydrating the fruit. A Food Saver comes in so handy for this. Great Post! I live in Camas and use a lot of the Bob’s Red Mill whole wheat pastry flour and have always wanted to make a trip out to the Milwaukee store. Maybe we’ll make a family weekend trip out of it soon! I check in with your site every day for good tips. Thanks! Bethany, I understand where you are coming from, and it definitely is one’s own personal choice what they will serve for their family and consider a healthy source of food. When I was working I only shopped organic, but now that I am not working my husband and I cannot afford the “healthier” options for food. We make sure our son (14 months) still eats organic, but he and I have made the temporary sacrifice to eat cheaply, until I go back to work. This is where couponing comes in. With that said, you might want to try mambosprouts.com you may find coupons that better fit your normal grocery list. I would like to say that I guess I get sick of people treating others as less or uneducated because they buy processed foods that come in a box. If you don’t like something that is okay, but I don’t like the idea that you are a bad mother or person if you buy processed foods. I don’t think you should have had to point out you make other purchases that are healthier as well. If you like fresh, non-processed food only, great, but please don’t think the rest of us are clueless or mindless. I buy cereal for free and 50 cents all the time and donate it to my church. It’s my small way of helping someone else in need even when I don’t have much myself. Thank you, thank you, thank you!!! I love all the deals you post, but sometimes my conscience will not let me buy some items. Even if they are “free” the toxic chemicals and extra packaging reek havoc on our children and the environment, which for me is like paying the highest price of all. Thank you for this post your hard work is very much appreciated! i’ve found coupon books at whole foods for lots of organic stuff, things that i’ll use like canned diced tomatoes. also, one thing my mom always taught me was that if i am not going to use something it’s not a good deal no matter how cheap it is. i never eat cereal, so as tempting as “oh! 25 cents a box!” can be, i don’t do it.